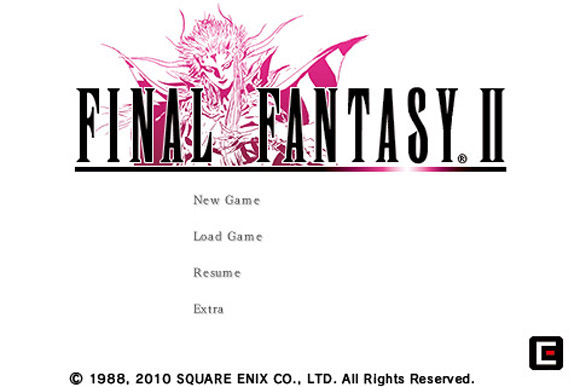 Despite the title, I like Final Fantasy II. I'll get to the face hitting part in a moment. 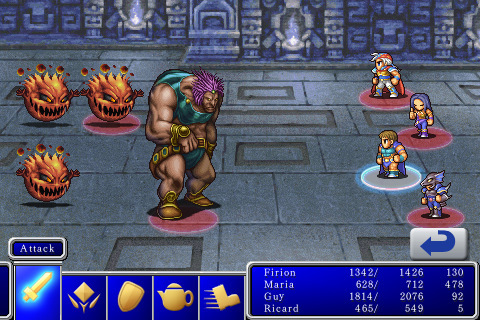 Overall, Final Fantasy II is very similar to FFI and, really, any other classic JRPG out there. All the genre staples are present; armor, weapons, gaining power, new abilities, a heroic quest. The 2D sprites are classic, but nothing to write home about. It's obvious that when Squaresoft was making FFII they wanted to keep it close to the first game. 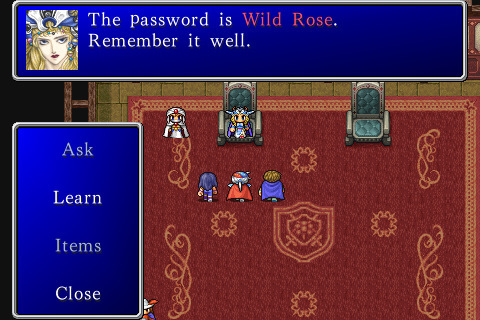 Don't count out those game designers at Square completely, there are differences in FFII. Whether they're good or not is another question. The leveling system has been completely redesigned. Each individual skill levels up with use instead of leveling up as an entire character. In theory it sounds interesting, and it's been used to great success in some modern games, but the problem is with the execution. For example, if a character ends a battle with much less health than they started it with (by taking massive damage) their max hp will increase. This was great and all until I realized that the enemies didn't have to be the ones that caused the damage. I immediately started gaming the system. I would go up against minor monsters while wandering the overworld and kill off all but one in battle. Then I would have all of my characters hit themselves in the face (I assume they aim for the face because I find that hilarious) until their health was critical, at which point they would finish the battle. This way their max health would go up after every battle. Face-hitting is the most funny example but spamming white magic on full-health party members worked great too. My spell levels skyrocketed with little effort. In Final Fantasy II's defense there were improvements. There are real characters in this game, with a back-story and motivations. It's much better than the empty shells in Final Fantasy I. And, better yet, there's a story! Things happen, there is cause and effect, events change the world. In FFI I was told that the enemy was evil and I had to kill his minions and then him. In FFII characters come and go, rebels rise and fall, superweapons are made and villages are decimated. It's nice to feel a connection to the story instead of just playing through the game as a series of dungeon crawls. The leveling system is an improvement in some sense. While it can be abused it also makes for interesting characters because there are no pre-set classes. My Firion isn't locked into being a mage, he can be whatever I want him to be. The same goes for the rest of my party. I feel like this is foreshadowing some of the ideas in FFVII's Materia system down the line. I ended up making most of my characters into the equivalent of a red mage and I'm having fun with the result. More of the Final Fantasy traditions are also emerging. I've already run into chocobos that can be ridden and a Cid that flies a handy airship. It will be interesting to see more of these appear as the series continues. Final Fantasy II is a decent old school JRPG and I'm having fun with it in bite-sized chunks. 5 minutes of play here, 10 minutes there and I'm happy. I don't know if I could sit down with this game for an hour straight, but I would still recommend it as a pick up and play title for mobile devices. I enjoyed FFII, but I started gaming the system pretty quickly, too. Trouble is, I think you *have* to game the system in order to get through the tougher parts of the game. Many JRPGs have pacing issues like that, though, so it's hardly a FFII problem.